Arvah Branch is a hidden gem of a neighborhood just outside of city limits on Miccosukee Road north of I-10. The average homesite falls between 1 and 5 acres, which is a very healthy parcel size for a home located so close to the heart of Tallahassee. Homes here are typically 25% larger than our median, so historically it's a place where you would have to spend about $250,000 to purchase a home. But the collapse of the housing market has brought opportunities for buyers who want to not only take advantage of lower values, but also capitalize on low mortgage interest rates. 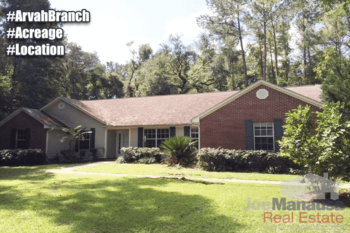 In this report, we examine prices, values, and sizes of homes in Arvah Branch, as well as the current listings in the Tallahassee MLS and all closed home sales going back to 2002. For each of the three real estate graphs found in this report, you will find the number of closed home sales for each year (blue columns, measured on the left vertical axis), and an important real estate statistic shown in red (measured on the right vertical axis. It is important to note that sales are through December for all previous years, but through mid March in 2015. Average home prices dipped 1% in 2014 versus 2013, leaving prices 14% below the peak of the market prices established in 2006. Distressed sales have been so much lower than other neighborhoods in Tallahassee, with only one distressed sale recorded since 2002, but this trend is about to reverse as both homes listed right now are short sales. The one closed sales price was $215,000 for Arvah Branch thus far in 2015. Home sales activity in Arvah Branch is sporadic due to its relatively small size. 2013 was a breakout year, posting 10 homes sold (second most on record). This year appears to be consistent with what we have seen over the past seven years, but it is still far too early to be certain. Thus far in 2015, there has been 1 closed home sales in Arvah Branch. Average home values in Arvah Branch show a 20% decline since last year, but that is due to the fact that there has only been one sale thus far. Considering the two properties listed right now are short sales, I would expect a significant decline in home values in 2015. In 2014, the average value of a home sold in Arvah Branch was $118 per square foot. This was up 5% over the the previous year, but still down about 15% from the market high set back in 2006. This means that many homeowners who have purchased or refinanced in the past 10 years are likely at zero or negative equity situations, and maybe that's why both homes on the market right now are distressed. The average home size sold in Arvah Branch typically falls in a range of 1,800 to 2,400 square feet, and this year features homes for sale towards the larger end of this range. The one home sold thus far in 2015 was 2,275 square feet. The following list of homes are the most recent listings in Arvah Branch. The following list shows home sales going back to 1991 in Arvah Branch. I hope you enjoyed our March 2015 update on home sales in Arvah Branch, please feel free to drop me a note if you have questions not covered in this report. What Can You Do When You Disagree With A Property Appraisal?